wide importance, who was his lifelong friend. Mr.
place and assisting in the management of tlie farm. energetic and ambitious young man in that country. horticultural department at tlie Chicago World's Fair. work of a high order. One of the earliest settlers at Federal Point after the Civil War was Captain Edwin Smith. We knew him, when little children, as a tall, slender bachelor with a long, slim, white Pharoah beard. He lived in a large building which he built near the wharf on Commercial Avenue soon after coming to the Point. He used this as a store. It later became a hotel. He had given up operating the store by the time we came along as Squire Tenney ran one next door in connection with the Post Office and the public wharf. The store was reason for your Grandfather Edwin Smith Hubbard coming to Florida as he came down to help run the store for his uncle and godfather, Edwin, for whom he was named. The title, “Captain”, was earned when he was a captain of sailing ships. He, also, formerly ran a ship chandler’s shop in New York City. He wrote a pamphlet titled “God’s Law For a Vessel”, which I have among my literary treasures. Captain Smith needed some one to help run the store and help work ten acre grove and truck garden a half mile up Commercial Avenue. So he sent for his nephew, Edwin – who had finished high school, lacked money to study for his chosen profession, the Congregational ministry, and suffered from catarrh in the Connecticut Valley air at Maromas. Thus, your grandfather and grandmother, Louisa Abigal Hart, became acquainted. Captain Smith lived alone in his big house after his nephew married and moved to his bride’s home, Three Oaks. He cooked his own meals and occupied himself with the care of his grove and garden. When I grew big enough, my mother would send me down, occasionally, with a covered dish of hot dinner. I would knock on the door and hear a chair pushed back and his footsteps come towards me along the hall, echoing on the bare, plaster walls. Then the key would turn in the lock, the door would open and Captain Smith would give me a cordial, courteous greeting and take the proffered covered dish, place it on the table of his front room office, open his iron safe, take out a cigar box and give me a nickel, dime or, on Christmas, a quarter – all the while humming a themeless tune. My mother objected to his “paying” from his scanty funds as the ’95 freeze had frozen his precious orange trees to the ground and his strawberries and garden truck were his only source of income. Captain Smith practiced organic gardening as fully as possible. Besides the rank growth of weeds and grass he worked into the ground or used as mulch, he secured all the cow and horse manure he could get. His main source of manure was the droppings which littered the street where the local milk cows and woods cattle pastured, and where the saddle horses, buggy horses and the horse and mule teams traveled or were tied near the store. Each morning and noon Captain Smith pushed his wheelbarrow gathering, with his shovel, the manna-like fertility scorned by the faddists of the new commercial fertilizer era. His land was fertile. His crops flourished. Captain Smith was warden of St. Paul’s mission church. Passing the plate was his prerogative. He became interested in the church at the Sailors Snug Harbor on Staten Island before coming to Florida. The first church services were held in his large, upper room. He passed around the subscription list to raise money to build the church on land given by the Hart family on the northeast corner of Three Oaks. Captain Smith provided interest for us, children, during long sermons, by using a leafy switch, which he gathered along the way, to shoo away the flies which alighted on his bld head during the service. A hungry galliniper mosquito would call for a louder, more vicious swish, to our great pleasure. When Captain Smith died he left the hotel to my father and his grove to the church. He stipulated in his will that he should be buried in a certain spot in his grove and provided money for a modest monument. A mound of soil, four feet high, eight feet wide and ten feet long, crowned with the stone is always to remain as his resting place, whoever may own the land. Once, while Frank DuPont was renting the land from the church to raise poitatoes, I went to see the stone an mound, now overgrown by low bushes. I was startled to see some large bones half buried in the sloping soil. I mentioned the bones to Frank DuPont, when I saw him. He chuckled and said that a yearling had died on the place and he had half buried it in the side of the mound, hoping that, perhaps, some one would find it there. It was also said the these bones were left to keep superstitious darkies away. And, so passes the memory of an interesting character, a sturdy individual, a pioneer who wove some of his independence, his adventurous initiative, his quiet, religious faith into the pattern of our family. May he rest in peace. Idyl Biddlecomb was born in Scofield, Michigan on Feb 22, 1880, the only child of Carrie (Kuhn) and William Biddlecomb. Her first marriage was to William Rogerson. Later, probably about 1923, Idyl and William Rogerson were divorced. 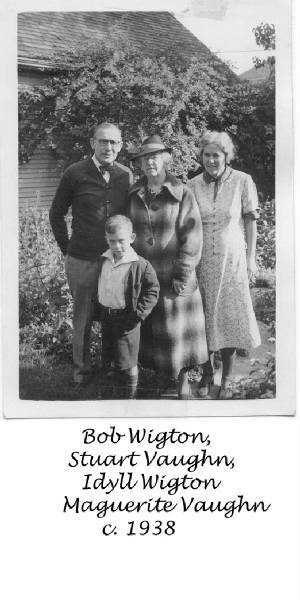 By 1923, the youngest son, Bill, was nearly grown and Idyl married Robert Wigton on September 5, 1923. They, together with a couple named Ida and John Crook, purchased a 11 acre parcel and house on the St. Johns River 12 miles from Palatka at Federal Point, Florida on March 8, 1926 for $4,000 from E. Stuart and Martha Hubbard. The following year, Idyl and Robert Wigton bought out the Crooks for $10.00 and other valuable consideration. They operated an orange grove and they sold & shipped oranges. Colder weather, which occurred in north Florida in the 1950's, froze out the orange trees, and few now remain. The original 11 acre parcel has now been divided, but can be identified by the Episcopal Church on the east corner of the property. Idyl Wigton was well known to me. I lived with her and Robert Wigton on several occasions. Although she had a minimal education, she was quite intelligent. She was very interested in and grew beautiful flowers on their Federal Point property; probably because her first husband, William Rogerson only grew vegetables. Grandmother Idyl Wigton drove like a race car driver; never letting the needle vary much from 50 mph regardless of the curve. Even as a child, I remember many white-knuckled rides into Palatka. Robert Wigton had been an actor and he had been married to a Elliamay Margerium on May 20, 1909 in Youngstown, Ohio.. I remember hearing his first wife went insane and she died on September 17, 1922 at the St. Claire Flats, Michigan. Robert's family ran a grocery store on Harson's Island (Star Island), St. Claire Flats, Michigan in the 1910-23 period when the only access to the St. Claire Flats was by boat. Robert was a bit prejudiced, but a nice man and very kind to me. His early acting experience gave him great ability to "tell a story". Every Sunday morning he & his buddies and they would talk politics - putting down the local politicians. Bob had great physical strength from using a scythe to hand cut "Pear Grass", a fast growing, obnoxious jointed, grass-like weed that grow and practically covered the orange trees. In her later years, Idyl went blind from glaucoma. She died on November 15, 1956 and is buried in Grand Lawn Cemetery next to her mother, Carrie. Robert Wigton was born in 1882 and died on Jan 30, 1964 and he is buried in lot 15 of Pinewood Cemetery on Main Street on east of the Halifax River in Daytona Beach, Florida. The grave can be located to the 15 yards east of the east dirt entry road just north of the Main Street entry gate. Idyl's 4 th child, Bill Rogerson, was born on July 30, 1907 in Highland Park. He never lived at Federal Point. 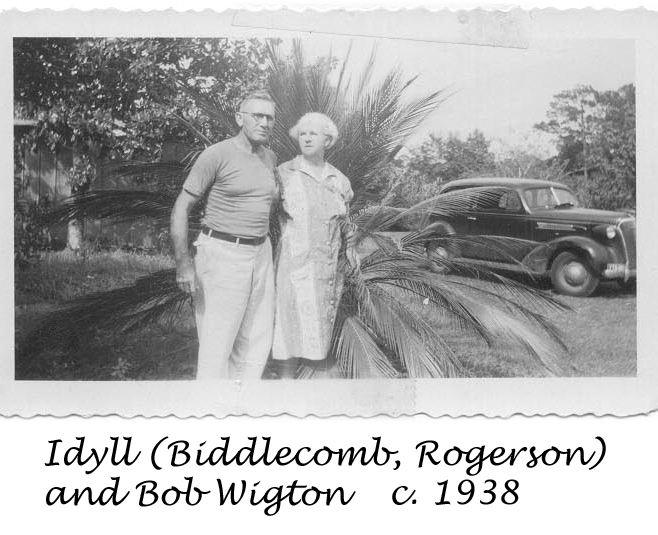 As Idyl (Biddlecomb, Rogerson) and Bob Wigton aged at Federal Point, Florida, Bill provided them supplementary income by purchasing their property. I can remember as a boy living with my grandparents that they looked forward to the monthly check. Ironically, in the mid 1980's David and I made an identical arrangement with Bill and Joan to supplement their income. In the 1950's, Bill heavily invested in developing a subdivision in Rose Township near Holly, Michigan. The development including raising an existing dam to enlarge Lake Braemar and this created considerable controversy and eventually a financial failure that drained Bill and Joan of much of their financial resources. Bill attended the University of Michigan in Detroit and took Psychology courses and received a draft notice into the army in March 27, 1941 under the Selective Service System and served until October 15, 1941. His official Army record indicates he was reinducted into the Army at Fort Custer, Michigan on January 15, 1942. Bill served in the south Pacific as a private and a sergeant and received several service ribbons, including 2 bronze battle stars. He was separated from the Army on October 15, 1945. Bill actively married Joan Westwater on December 7, 1945. After the war, Bill ran an electrical contracting business at 15920 Fenkell in Detroit. Bill died January 19, 2004 and is buried next to his mother in Grandlawn Cemetery in Detroit. Stuart was born in a Highland Park, Michigan At 2 years old, he contracted glomerulonephritis; possibly caused from a measles infection outbreak in the region. During much of that period Stuart lived with his grandparents at Federal Point. The family returned to the house on Greenview in Detroit in the period 1936 -1938. In the summer of 1938, Stuart went to live with my grandparents in Florida again for a short period. The family lived in Bill Rogerson's house in Detroit. In the summer of 1943, because his mother was working, Stuart went to live with my grandparents in Florida. He attended the 7 th, 8 th, and 9 th grades in Palatka.. The Florida property consisted of 11 acres, composed of the house, garage, wash house, packing house, orange grove, and two large fields which were rented out to local farmers. Grandfather Wigton raised oranges and sold them in St. Augustine and mailed crates around the country. Stuart was graduated from Duke in Civil Engineering. Stuart and Barb Falconer were married a May 28, 1955 and have 4 daughters. Stuart spent most of his career in Ford World Headquarters, eventually managing Ford's environmental engineering activities. The department was responsible for planning, design, and operational assistance of facility environmental control facilities for Ford worldwide operations. Late in 1988, Stuart had a routine Ford executive physical examination at Beaumont signaled a much increased blood pressure which medication couldn't control. This caused his historic kidney function, about 25%, to decline steadily to 10% in January 1989 and it was obvious that kidney failure was inevitable and dialysis and/or a kidney transplant was going to be required. On April 5, 1989, at the University of Michigan Hospital, Stuart's brother, David, donated one of his kidneys to Stuart. The transplant was very successful. Stuart and David Vaughn purchased the Federal Point from William Rogerson. Because of uncertainity associated with the transplant, they sold the property to Jim Mast. In December 2003, Stuart's transplanted kidney started to fail and on July 31, 2004 Mayo Clinic initiated kidney dialysis.